Does Walking With Crutches Strengthen Abs? 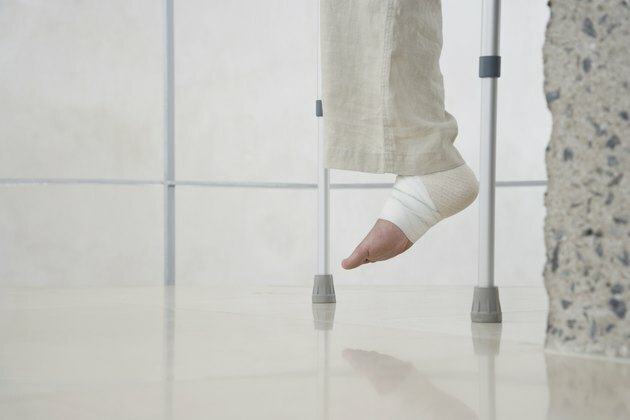 If you are injured, walking with crutches can be a daunting task. It takes coordination and balance, as well as muscle strength, primarily in your arms, although your abdominal muscles will also be engaged.. Although you will need to engage your arm and abdominal muscles, ultimately strengthening them, learning how to properly walk with crutches can help you to avoid unnecessary strain. Your abdominal muscles are classified into four main groups: the transversus abdominus, the rectus abdominus, the external oblique muscles and the internal oblique muscles. The muscles provide stablity for the trunk of the body, move the upper torso and help to hold the abdominal organs in place. All of the muscles are located in a space between the floor of your pelvis and the bottom of your rib cage. Several types of crutches are available, but the most common are axillary crutches. Axillary crutches have padded tops as well as a hand grip about halfway down from the top of the crutch. You use them by placing the tops of the crutches under your armpits and grabbing the hand grips to keep the crutches steady. The bulk of your weight is supported by your arms and shoulders when you use axillary crutches, but your abdominal muscles are also engaged, primarily to keep your trunk upright and your torso stabilized. The abdominal muscles are also engaged when you step forward with the crutches. Crutches that don't fit properly put undue stress on your muscles that can lead to cramps, fatigue and possible injury. Properly fitting axillary crutches should have a space equal to 1 inch and 1 1/2 inches between the top of your crutch and your armpits when standing up straight, according to the American Academy of Orthopaedic Surgeons. The hand grip should be even with your hip, and you should bend your elbows when using the hand grip. Hold the crutches close to your torso and avoid letting the tops of the crutches press into your armpits. Consult your doctor or physical therapist regarding the proper way to move with crutches. If you are going to be using crutches after a scheduled surgery, talk to your doctor about exercises to strengthen your abdominal and arm muscles. Using crutches will give your abdominal muscles a workout, but being prepared can help to prevent or reduce possible muscle fatigue and soreness. If you are using crutches as the result of an injury, pace yourself and take plenty of breaks when moving to avoid straining your muscles.